What was it like observing in the 60’s? 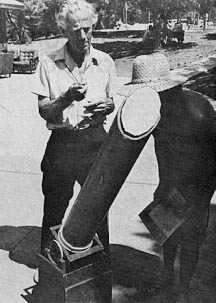 What were the conversations about regarding telescopes and observing and what were they like? Were you reading books and looking at star charts? What problems did you mostly discuss and what encounters did you have? Today all I listen to is computer technology and software and seeing the billionth cell phone image of M31 someone took. I remember the days at scope city in the 90s and all people talked about was Astronomy and what they saw. How about you guys? Edited by Daniel Mounsey, 19 October 2018 - 01:31 PM. - Equipment was simpler, and KSAs (Knowledge, Skills, & Abilities) were higher (I tapped into a pool of Amateur Experts at the B'ham Club back then). - S&T Ruled! Great articles that encouraged you to learn more. And those nice monthly Star Charts!! And the Ads!! - Skies were Darker! Light Pollution has reached all the way out to where I grew up in Hicksville / Hooterville / The Stix. 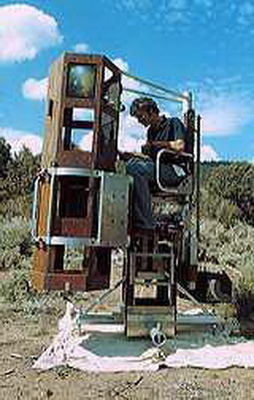 Observing in the 60's was much more exciting, because when you could see something like the GRS, you could feel good about your scope, and wanted to look for more. Now all you have to do is google the GRS, and you can see thousands of pictures that make you wonder why even own a scope. Pictures that you could never see visually through a scope. All the simple things in life are fading away, and this will too, if we let it. The advertising market of astronomy is overwhelmed with all new kind of technology that some of us old timers do not even understand, and I personally, do not want anything to do with it. I have good memories of the 60's, catalogs from Scope City, Edmund, etc. Using simple scopes with excitement of Life on Mars, maybe seeing a UFO, the old Flash Gordon movies, those are the good old days. Palomar observatory was a place that you wish you could visit, now you hardly ever hear of it. I don't know, many probably feel different, but those days can never be replaced with the modern technology that does away with your imagination. I still do it the same way today as I did in 1968, just with bigger and better telescopes. I still use a paper atlas. So, not many changes for me. Late 60's for me. Used my grandfather's refractor which came from a Navy ship, a "spyglass" of 16X and 90mm aperture. The Moon looked so great. I did star-hopping, as it was just on a tripod, no mount and no setting circles. For my then-teenaged self, it was fun and exciting. 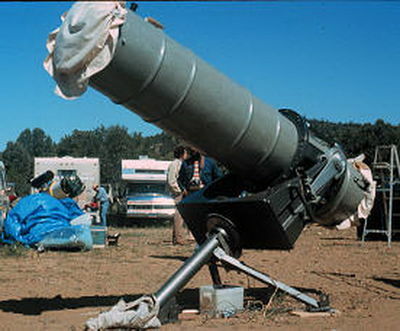 In those days, I did not know anybody else using telescopes and looking at the sky. Nerdy kids, especially girls, were subject to cruel behavior from the other teens. It took until the 1980's for me to find my "tribe" of fellow observers. There was much more ATM activity then. Status went to people who did Variable star work. 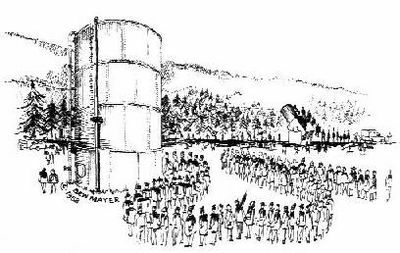 Observing the Messier List was considered a big deal. Sometimes here on CN, a beginner will ask a question with an answer that is easily using Google. I remember "back in the day" when it took actual library hunting and purchasing books and S&T magazines to find out things. Edited by ShaulaB, 19 October 2018 - 01:59 PM. I was oblivious to the entire industry. I had the scope given to me by my parents and spent countless hours searching the sky. I never thought about how crummy my telescope and eyepieces were. I thought they were wonderful because they opened up a new world. I think the only astronomy book I read (age 8 - 13) was the How and Why book on the subject. Strangely, I now spend far more time reading, talking and thinking about astronomy and equipment then I do observing. I'll be interested to follow this thread to see what was going on while I was in my star gazing cocoon. I'll take you all the way back to the 1950s! Clubs were quite active, and interest was as enthusiastic as it is now. Our personal scopes were mostly home-made Newtonians or bought. A 6-inch reflector was about it. Anything bigger was considered giant. People knew the sky, constellations, etc. way better than now. Delayed gratification was the norm. Imaging two or three hours single frame onto film, then processing it in the basement. No GoTo etc. Used setting circles and star-hopping to find stuff. And the skies... were darker... MUCH Darker! I recall the DARK sky from what is now the middle of an impossibly light-polluted Rochester, NY. A Newtonian reflector had a fair chance that its mirror was actually hand-ground and polished by an ATM. 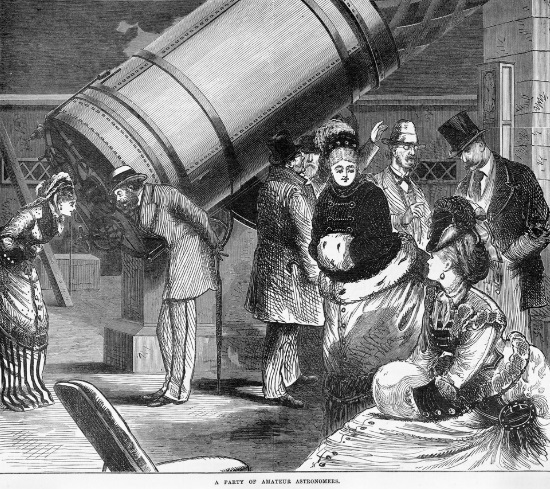 Pretty much most scopes were Newtonians and small refractors, with a few Cassegrains thrown in. I remember parking on the road going into RTMC because it was so full (over 2,000 people). I sold some stuff up there about 3 years ago, was like a ghost town. I blame the OC group for getting there sticky fingers in there & jacking up the cost every year. In the 60's I had no money, no telescope, no binoculars. All I could do was lay in a field after dark and lookup. Of course it was darker at my home in the country and looking up with my friends was fun. None of my friends could afford a telescope back then either. Everything was black and white. Color didn't 1st appear until the early '70s. I've written some of this previously on C-N, both privately and publicly. My first "real" scope, which I bought in 1956, when I was twelve, was an unpainted aluminum-tubed 4.25" Newtonian. It had a 6x30 finder, and a cast-aluminum equatorial mount on an aluminum 3-legged pier. The EQ mount had no internal bearings on either of its shafts, and no drive-motors, slow-motion controls or setting circles. For the next eighteen years, that Newtonian was the only scope I owned. But long before I got that scope, I'd bought a cardboard Planisphere, and used it to learn my way around the sky. And thanks to that Planisphere and a hardback copy of Norton's Star Atlas... within a year after getting the Newtonian -- even though it had no setting circles -- I could star-hop my way to anything that that scope was capable of seeing. 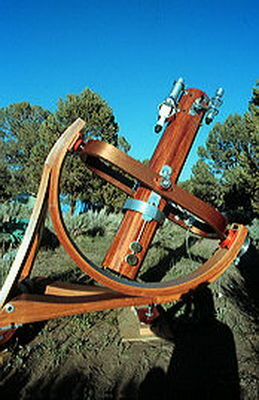 The local college's physics department had a 7.5-inch Clark refractor, and their astro-club was permitted to use it. Just walking up to it and looking at it, was like being in the presence of an alien spaceship. A real "professional" instrument. A field trip with that club to visit another one in a city fifty miles away, allowed me my first look at -- and through -- an EQ-mounted, clock-driven reflector that had an absolutely enormous eight-inch mirror, that had been ground and polished by the club's own members. That a completely amateur-based organization could own such a thing was mind boggling. My dreams of the possibility of someday owning an equally "gigantic" instrument suddenly expanded by many orders of magnitude. I grew up in a northeastern town that had a population of ~15,000, complete with two glass factories, a steel mill, and a brick yard... and which was surrounded by corn fields, dairy farms, and unending miles of woodland. Streetlights in those days were shielded, so their light never went upward. From my parents' back yard, the dark rifts in the Milky Way were black. Peering through the eyepiece of a telescope back then, imagination and awe held sway. 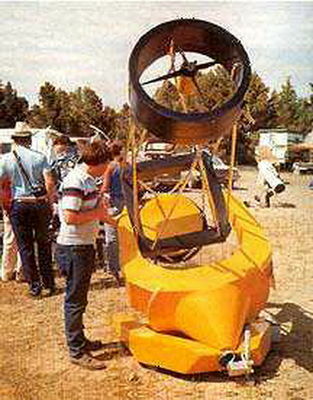 Sputnik hadn't yet been launched... and Wells and Verne and Van Vogt ruled our musings. The craters on the Moon and the polar caps of Mars brought forth visions of extraterrestrial life that, if only we could communicate, would astound us with their intelligence and knowledge. Do I love my current instruments, and what they're capable of? You bet I do. But can I still star-hop... and do I? Absolutely. My shiny plastic Planisphere and laminated field edition of Sky Atlas 2000 are always on the table next to my scopes. Do I hate that we've become so populous that I'd have to drive for three hours to get to a site that's as dark as my home town was back in the '50s and '60s? Yes. Do I sometimes long for those "better" aspects of the "good old days"? Of course I do. But do I still step outside every night -- even if it's only partially clear -- just to get some of those billion-year-old photons into my eyes and my consciousness? Do I really need to answer that? Edited by B 26354, 19 October 2018 - 04:39 PM. I didn’t start till the 70’s but there was no internet, no forums, no 500 different brands of scopes and face to face conversation were more interesting than forums. Now every topic in refractors, reflectors and SCT’s and up in the same arguments and discussions about what scope is better. APO vs Achros, this vs that and it gets old. Same folks posting the same thing for years on end. A few times I’ve thought of quitting the forums altogether. Now every topic in refractors, reflectors and SCT’s and up in the same arguments and discussions about what scope is better. APO vs Achros, this vs that and it gets old. Same folks posting the same thing for years on end. A few times I’ve thought of quitting the forums altogether. LOL, so of course you decided to start another thread on it today. I was 12 in 1969. I had Sears 60 mm scopes since I was 8 or 9. I had one classmate who's neighbor had a Sears 3.1 inch 80mm scope which my friend made sound like the Holy Grail. Being that young I was a bit fearful to be out at night by myself but the pull of the skies kept my courage up. Everything in the sky was a mystery back then. It was amazing when the first closeups of Mars occurred in 1966 and astronauts took halting steps to landing on the moon. I am so glad we now know what all he planets in the solar system really look like but back then only a telescope could show those beauties. I don't have anything to tell about the 60s, but I can comment about the early 70s. I remember my first introduction to amateur astronomy. My BiL, who was in his final two years at Syracuse University after a stint in the Army, asked me if I'd ever looked through a telescope and if I'd like to. He was about 25 and I must have just turned 12 (my God, that was a LONG time ago). My Bil was taking an astronomy class at Syracuse, and his father built a 6" scope after the war. My BiL showed me Saturn, M13, M57, M42, and I was hooked. Then Kohoutek (sp?) was dubbed the "Comet of the Century" (turned out to be the dud of the century) and I decided I wanted a scope. For my 13th birthday my folks bought me a 60mm Jason. And I used the snot out of it all through HS. At the same time, I joined the Rochester Academy of Sciences Astronomy Section. As such, I could sign out the key to the observatory on the roof of the planetarium, and was able to use a 12.5" Cave Observatory Model scope at will as well as a 8" Deluxe Dynascope. Talk about opposite ends of the equipment spectrum (my scope and the Cave). A friend and I spent nearly every clear summer night at the observatory. We used a Skalnate Pleso atlas for star hopping and a list of the Messier objects and common NGC objects along with the setting circles on the Cave. The main EP was a tank EP (my eyes probably glow in the dark now) that offered up great wide-field views (for the day). The Cave had a driven RA circle, so setting it once a night was generally all you needed. The club was amazing. George Keene, Ralph Dakin, and Dr. Henry E. Paul were members, as was Rick Albrecht who commented on the George T. Keene birthday thread. In the junior section I made life-long friends. Only one I was close to is lost to the group. We are all still in contact after all these years. It was one of the greatest groups of people I've been a part of in my life. We became true friends and still got together most weekends, even if it was cloudy. As Tom said, the skies in the middle of Rochester would be considered dark skies today. I could see the Milky Way from my backyard in the city (and I complained about light pollution back then!). I saw the aurora on several occasions, from very clearly, to faint wisps that traveled through the sky, but you could only catch them with averted vision. I read every decent book I could find (the planetarium library was really good). As somebody stated, S&T was amazing. Oh, and I should point out I went to Stellafane in '75 & '76 (and I'm in a photo on the lead page for the Stellafane article in '76). That was just before the Dob craze and there were some truly amazing scopes there. 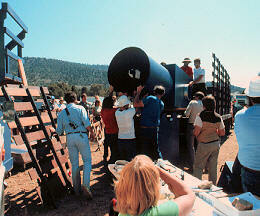 In '75 there was a 12.5" scope that I presume was built by a machinist. It looked like a miniature observatory scope. The mechanical bits were all machined from aluminum. It not only had drives on both axis, but it was the first amateur scope I ever saw that slewed as fast as a modern Go-To mount. Lastly, I guess I should say it was an amazing time for ATM. There was still a large supply of surplus optics being sold. Making your own mirrors was far more common than today. And most ATM scopes had Eq mounts, some of them really really clever and/or well executed. Cool stuff. I'd also like to say that looking through an EP and seeing such amazing things across such vast distances never got old for me. I still think it's amazing that all that stuff is out there for us to see if you just know where to point your scope. Edited by Geo31, 19 October 2018 - 04:25 PM. Edited by rolo, 19 October 2018 - 04:35 PM. Lot's of folks complaining about light pollution increasing, and I would agree but it hasn't been quite as bad here. I remember complaining about it when I was twelve years old, and the skies are about the same, from that location. But it has gotten worse in some directions, due to population increases and land development. I used to have to drive for 30 minutes to get to decent skies, now it's almost an hour. From that site, the light dome over the metro area only went up about 5 degrees. Today it's closer to 15 to 20 degrees, pretty much wiped-out the sky near the eastern horizon. The skies were darker, the towns were smaller, and there was a sense of optimism about space exploration. I was lucky and got a Sears 60mil for Christmas when I was 11 and it was formative in my love of the night sky. 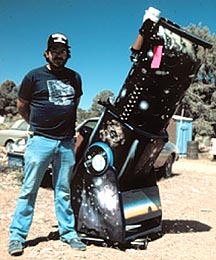 For most young lads that was the best we could do, but the high school astronomy clubs were busy grinding and polishing their 6" mirrors that mostly rested on a homemade Alt AZ pipe mount. That was the cat's meow in my neighborhood and the only person I knew that had a larger scope was an astronomy professor who also led the astro club. By modern standards my scope was poor, eyepieces poor, finder awful, but I still spent a lot of hours with it under the stars on a voyage of discovery. Good times! The music was better, too. Had to get that in. I remember taking heat from the older folks in the club who didn't like me playing the car radio while observing. I remember looking out my bedroom window and spotted some glow just above the spout of Sagittarius handing out over the Gulf of Mexico. First time I realized Messier 8 was there. Yes, dark skies in our own back yard. I scoured my fathers star charts listening to classic rock and poured through his issues of S&T. Nostalgic, really. I had a Sears 60mm refractor from a pawn shop and saw Saturn for the first time. My friend, Dougy, ran down the street with it to spy on his girlfriend. I also did my first mod allowing it to piggyback a camera so I could take wide field timed exposures. My father had a home built fork mounted 8" Newt, a decade later he'd guide me through Texereau's book to make my own. Been at it ever since. Nope. Ken did and was kind enough to delete it. I'm capable of starting my own topics and certainly don't any help from moderators. Late 50's and early 60's in Detroit skies were much darker. Thru a 60mm Tasco refractor it was a thrill to follow Sputnik & Echo satellites every 2 hours. It was fun looking thru old Sky & Telescope magazines at various telescope ads. And reading articles from Walter Scott Houston with his 4" Unitron. Things were so much simpler back then. Most photos were in black & white. The world seemed so much safer & neighbors knew who you were. Then I progressed to a Tasco 4-1/2 inch reflector & I thought I was in outer space. Orion & Ring nebulas opened my eyes even more in Astronomy. I would say that what I seen in those early days with a 4-1/2 reflector nowadays you would need a 8". I had a Dearborn Telescope Shop 6" f/4 RFT which showed M4 in Scorpius in the late 1960s as good as today's light polluted skies with a Discovery 12.5" f/5 Dob just outside of Detroit. I was a little kid throughout the 60's and not really into astronomy. My older brother did have a "huge" 60mm Tasco and seemed to take it out quite a bit. I remember him once showing me Saturn, but don't remember if I ever looked though it again until he returned from the service in early 70's. Still, it was enough to get me into the habit of looking up at the stars whenever I was outside at night. Somehow, as others have mentioned, the sky just seemed darker then.